Charter Hall’s newest Brisbane development, 100 Skyring, is three months ahead of schedule with the first tenants to move in from November this year. The $175 million, 12-storey, A-Grade office building is located 1.7km from the CBD in Newstead’s Gasworks precinct. 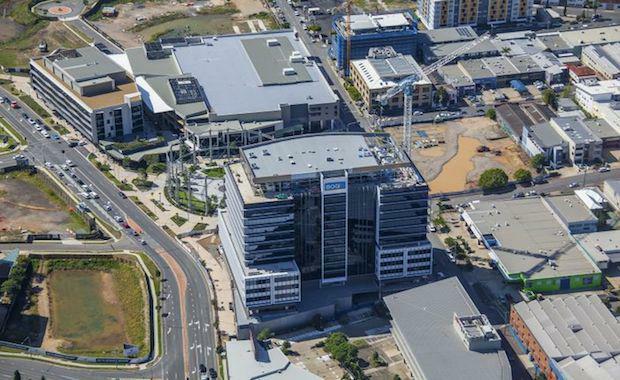 100 Skyring consists 23,759sqm of office and retail space and will be the new national headquarters for anchor tenant BOQ, which has leased 54% of the building. Charter Hall Regional Asset Manager, Belinda Kalinin said good planning by the Group’s in-house development services team and Hutchinson Builders, the appointed design and construct contractor, had helped push construction of 100 Skyring ahead of schedule. “This month, Hutchinson Builders has installed the final level of facade, allowing interior work to ramp up,” she said. Ms Kalinin said the building was attracting interest from companies looking for large, flexible floor plate office space in Brisbane’s near city market. “100 Skyring has been designed to deliver large 2,200sqm campus-style floor plates in Brisbane’s fastest growing office precinct, Gasworks. We anticipate the growing appeal of Gasworks as a centre for business, and as a lifestyle and entertainment destination, will also draw tenants to the building. Chief executive Stuart Grimshaw said the move to BOQ’s new headquarters at 100 Skyring offered a unique opportunity to transform the way staff worked. “Our move to Newstead is being driven by a desire to fundamentally change the way BOQ staff work with each other and help customers – our new building will offer a far more flexible and collaborative work environment,” he said.